The event runs from March 8-10 at The Pavilion with a trade preview on March 7, hosting 45 dealers who bring anything from samplers and lighting to Nordic furniture and glass. Among the wide selection in this staging are a range of diverting curios. A remarkable hand-painted 19th century chessboard, for example, is available from Mark Stacey Antiques for a price in the region of £2200. 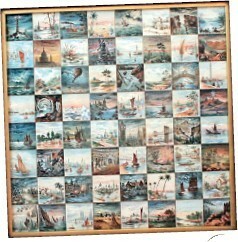 Sixty-four scenes from around the world are picked out in delicate watercolour on the 13in (33cm) square board, offered in its antique oak frame. 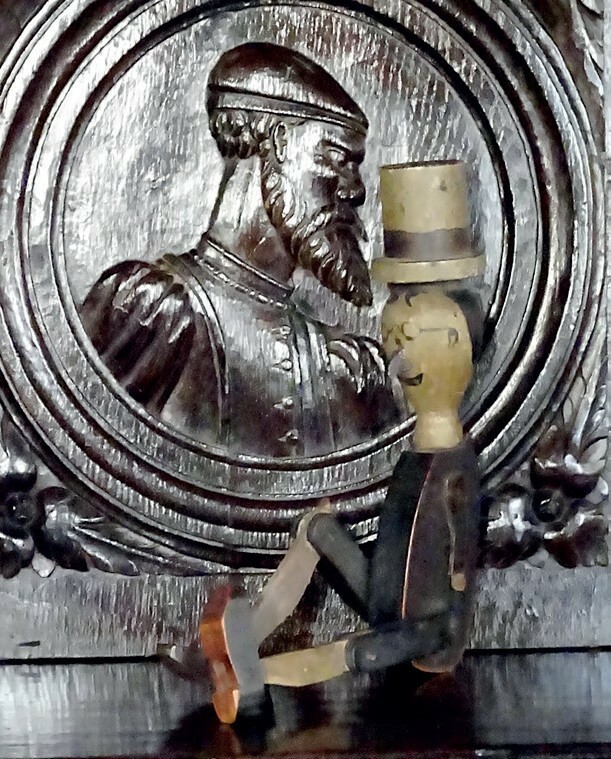 It is signed and dated Chris Barratt, 1889, identifying it as the work of an otherwise unknown maker. “We’ve never seen anything like it. It’s an amazing one-off piece,” says Stacey. He adds that while some of the squares are generic topographical scenes, many depict major landmarks such as The Houses of Parliament in London, the Bridge of Sighs in Venice and New York City’s Brooklyn Bridge – a recent feat of engineering at the time of painting. There is even a scene of a Royal Canadian Mounted Police or ‘Mountie’ gazing over a wooded landscape. “The games market is quite popular, but chess is a particularly collectable field. Boards are made of all materials from simple wood to ivory to gold and bronze,” Stacey says. To play a game the board would be oriented with the white square in the right-hand corner for each player, thus neither would be seated with an upside-down view of the pictures. This Lord Roberts Noah’s Ark, c.1920, is offered by Erna Hiscock & John Shepherd for £600. A wooden Lord Roberts Noah’s Ark on offer from Erna Hiscock and John Shepherd has a folk art charm. The English model comes from the special workshops pioneered by Field Marshal Lord Roberts (1832-1914), who campaigned for more to be done for disabled British ex-servicemen. He took an interest in the workshops set up to help rehabilitate soldiers after the First World War, and they were named for him in memorial in 1920. These soldiers produced a variety of goods including beds, basket ware and toys. 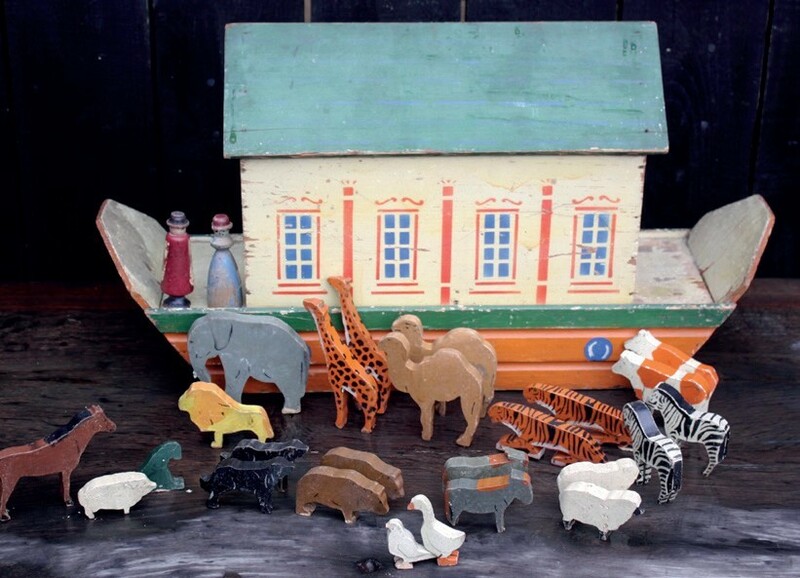 Noah’s Ark toys date back to the early 19th century and some command high prices – up to around £10,000 – determined in part by the number and condition of animals included. The example in question, relatively late in the history of ark production, is offered for £600. Perhaps best-known are earlier German models. One of these, a c.1870 example from the Erzdebirge region, is also offered by Hiscock and Shepherd. It includes more than 60 animals and is available for £650. “These arks are visually appealing with lovely colour and are highly collectable,” says Shepherd. Both examples have distinct signs of past use which add to their charm. The same is true of a set of three 19th century toy horses of French or English origin brought by Cool Stuff Across the Pond. The trio is of graduated height, the tallest measuring around 2ft 2in (65cm), and they are offered together – as they were acquired – at £1800. Each includes a wheeled pedestal, by which they would once have been dragged around on a string. “They have been quite seriously played with,” says the dealership’s Phil Taylor. “The saddles, bridles and tack they were made with is mostly missing now and one of the little cast-iron wheels has been replaced with a wooden one. 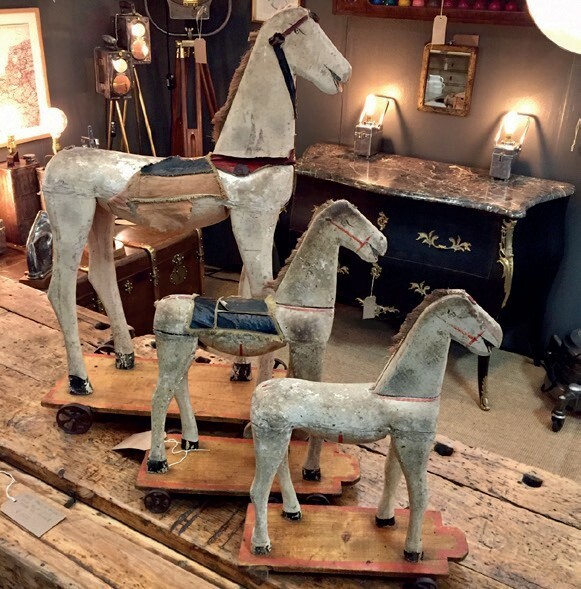 Also available at the fair are garden and interior decorative items, costume jewellery, paintings, period furniture, architectural pieces, porcelain, bronzes and much more. Sue and Peter Ede of Cooper Events organise the annual event as well as its sister fair in Bruton in October. This year is the 30th anniversary at the Pavilion, but it proves with its offerings that it is still young at heart.